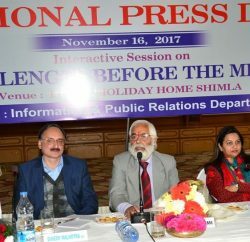 Shimla: Dinesh Malhotra Managing Director Himachal Pradesh Tourism Development Corporation today took over as Director Information and Public Relations. 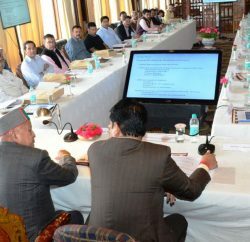 Malhotra, while addressing an informal meeting with the officers of the department, stressed upon speedy dissemination of news as well as policies and programmes of the State Government to every nook and corner of the State so that people could be made aware of the welfare schemes being implemented. 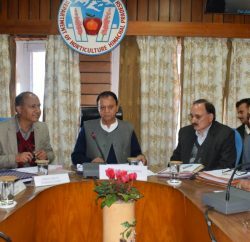 Underlining the importance of media in disseminating the information, Malhotra asked the officers for maintaining cordial relations with the media persons and added that data bank of department should be updated on regular basis. He directed the department to strengthen feature service as well as publicity through electronic media. He said that publications of the department were effective medium for reaching out to the public and asked the officers to work upon publishing them more frequently. Malhotra said that efforts would be made to strengthen the department by technical upgradation in order to keep pace with the modern technological advancement in the field of media and publicity. Social media can be of great help to achieve this objective, he added. Additional Director RS Negi, Joint Directors and other senior officers of the department were present in the meeting.